Have you ever had the feeling that someone is watching you? Halloween has never been my favorite holiday, but for some reason I am totally getting into the spooky, creepy spirit. I tend to lean toward the benevolent scary creatures of Monsters Inc. rather than the hair raising likes of the Exorcism. Did you know that the Exorcism is based on the true story of 13 year old boy here in St. Louis? Yikes! My hometown is also the location of several haunted mansions. Anyway, you get the gist. I'm having fun getting in the mood and preparing the decorations. 1. Cover your surface with a sheet of parchment paper. HINT :: It's my favorite crafting work surface as it makes for easy clean up and items won't stick to it. Squirt some paint onto the paper and paint the ball orange. Allow to dry. 2. Use your paper cutter to measure and cut 5 squares of spooky paper, each 3"x3" in size. ( You could also use a ruler and scissors.) Glue the squares to 5 sides of the cube. For the bottom, measure and cut a 3"x3" piece of felt. Glue the felt to the bottom. Allow to dry. 3. Using a knitting needle or screwdriver, poke a hole into the ball that is nearly 1/4" in size. Measure to find the center of the cube's top and poke a hole with the screwdriver or knitting needle. 4.. 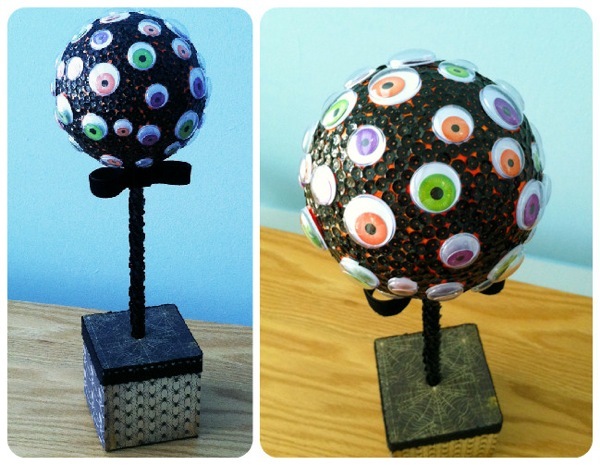 Glue a googly eye onto the ball. Pour some sequins onto your work surface. Squeeze some glue around the googly eye. Dunk the tip of the toothpick into the glue. Use the sticky side of the toothpick to pick up a sequin and position it into place on the ball. Keep working, rotating between adding a googly eye and then more sequins until you have covered the entire ball covered except for the hole. Allow to dry. HINT :: To keep your ball from rolling around on your work surface, use a jar lid or large biscuit cutter to hold it in place. 5. 2" down from the top of the dowel, glue one end of the sequin ribbon into place. Wind the sequin ribbon around the dowel until you are approximately 2" from the bottom of the dowel. Glue the other end of the sequin ribbon into place. Allow to dry. 6. Push the dowel into the ball and then into the cube until flush with the sequin ribbon. 7. Cut 10" of the black velvet ribbon. Glue the ends together to form a loop. Cut a 1.25" piece of more ribbon. Wrap it around the center of the loop. Glue into place. Use a hot glue gun to glue the bow onto the sequined dowel. 8. Cut a 12.5" piece of black lace ribbon and glue to the top edge of the cube.